Northern New England is full of reminders of past lives – stone walls, old foundations, a century-old lilac struggling to survive as the forest reclaims a once-sunny dooryard. On Monday, June 8 at 6:30 p.m. in Taylor Community’s Woodside Building, Adair Mulligan will explore the rich story behind such abandoned places and see how one town has set out to create an inventory of its cellar holes, piecing together the clues left behind on the landscape. This program is free and open to the public and made possible through a grant from the New Hampshire Humanities Council. Please call 524-5600, Monday-Friday between 8 a.m. and 4 p.m. to reserve seating. Mulligan has a runaway curiosity about the natural and cultural history of Northern New England. 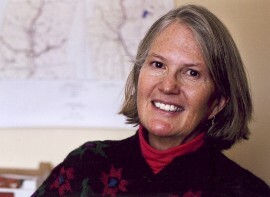 She is author of “The Gunstock Parish, A History of Gilford, New Hampshire,” as well as contributing to a number of publications. She writes the quarterly Lyme Historian newsletter and is co-leading a project to survey the town’s many cellar holes. With a master’s degree in Environmental Biology from Smith College, Mulligan is also Executive Director of the Hanover Conservancy.